Kemar Roach picked up four wickets as West Indies ripped through the England tail, dismissing the visitors for 277 runs in their first innings in the third and final Test of the series. The second new ball, allied with good bowling and sharp fielding, helped West Indies restrict England’s total to a smaller one than might have been expected on the second morning at the Darren Sammy Stadium. Shannon Gabriel, fastest of West Indies’ four-pronged pace attack, set the skids in motion when he bowled Jos Buttler for 67. 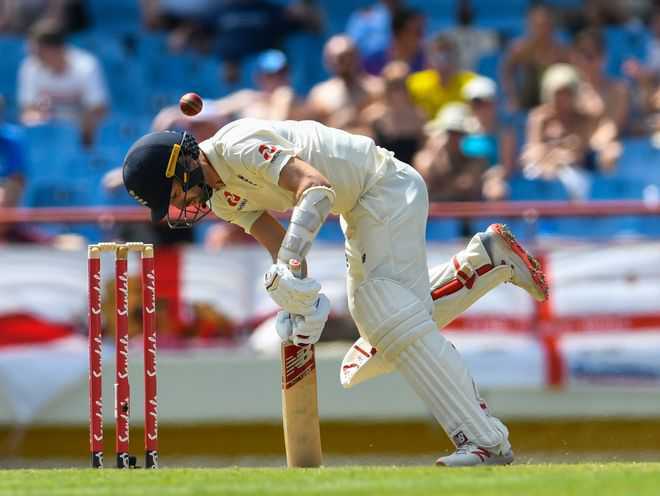 Butler did not add to his overnight score, and the dismissal ended a 125-run partnership with Ben Stokes that had allowed England to climb out of an early hole. Stokes went eight overs later for 79, caught when he mistimed a pull, and after Moeen Ali (13) and Jonny Bairstow (2) went cheaply, West Indies quickly mopped up the tail, picking up the final four wickets for seven runs. Roach finished with 4/48, while Gabriel, Alzarri Joseph and Keemo Paul collected two wickets apiece.